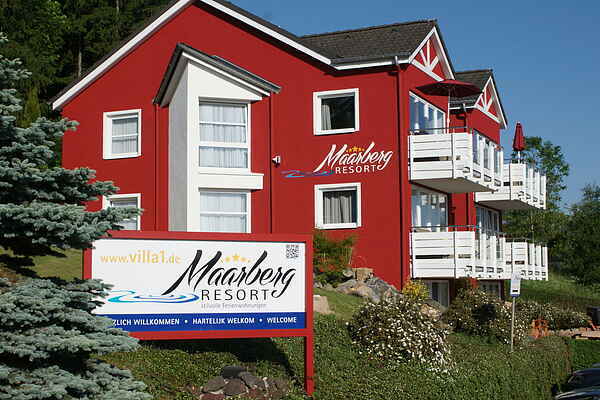 The nine Maarberg Resort luxury studios and apartments are divided over three storeys. There are apartments for two to six people. All the apartments are finished in a luxury, modern and comfortable style. On the ground floor there is a 2-person studio with a steam cabin (DE-54552-87) and a 2-person studio with a steam cabin and whirlpool (DE-54552-88). The studio with steam cabin and whirlpool also has a TV and DVD player in the bathroom. Finally, there is a 4-person apartment with a steam cabin (DE-54552-89). There are three apartments on the first floor. These comprise a 4-person apartment with a steam cabin (DE-54552-90), a 6-person apartment with a steam cabin (DE-54552-93) and a 6-person apartment with a whirlpool (DE-54552-95). The studio with steam cabin and whirlpool also has a TV and DVD player in the bathroom. There are also three apartments on the second floor. A 4-person apartment with a steam cabin (DE-54552-91), a 4-person apartment with a steam cabin, a whirlpool and a TV and DVD player in the bathroom (DE-54552-92) and a 6-person apartment with a whirlpool and TV and DVD player in the bathroom (DE-54552-94). All the accommodation units are designed with luxury in mind, and are finished with an eye for detail. For example a number of the bathrooms have LED lighting in the floor and some of the apartments have a cosy decorative fireplace in the lounge. All the bathrooms come with a radio. All the kitchens are fully equipped, including a dishwasher, oven, microwave and fridge/freezer combination. All the lounges have a 127 cm HD flat screen. The studios and apartments on the ground floor have a terrace which borders onto the beautiful pond. The apartments on the first and second floor have a balcony. From here, there are many wonderful views over the lake. Garden furniture is always available for guests' use.